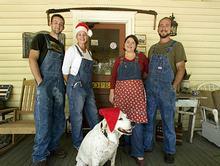 Mosswood Farm Store & Bakehouse is family-owned and operated right here in Micanopy, FL. We opened our doors in 2007 as a sustainable living store and quickly morphed into a growing bakehouse, coffeehouse & bookstore with a passion for environmental-friendly practices including supporting the local economy, promoting sustainable and organic food practices, taking care in only sourcing quality natural, sustainable goods and making those products available to our customers. Through our shop and the products and books we carry, we are able to spread our values and knowledge we gain along the way with folks we encounter. We take pride in our work, we love what we are doing and it shows. We are as much a gathering place as we are a shop. We occasionally host meetings for local permaculture activists and the Micanopy Transition Initiative. Also, we are excited to begin hosting a monthly wood-fired pizza night and music jam in our backyard. Mosswood turns 9 in 2016 and we are excited to see what the next chapter in this venture brings. Left to Right, Conner Lassiter, Jessica Piazza, Emily Piazza and Joseph Pierce. From Southern Living December 2010.